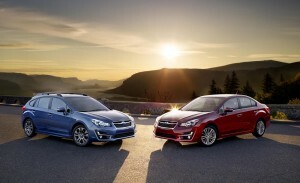 2015 is a very big year for Subaru, with new WRX, Legacy and Outback models and a refresh of the Impreza. 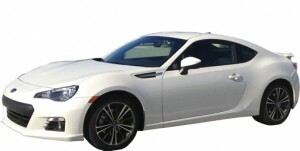 The BRZ gets revised suspension tuning, intended to improve ride and handling. Standard larger exhaust tips, shark-fin antenna and simulated carbon fiber dashboard are all new for 2015. A Series.Blue Edition gets aerodynamic body add-ons, black painted STI wheels and other unique trim items. Only 1000 will be sent to the U.S.: 500 in blue and 500 in white. The aerodynamic aides, which include a full belly pan, lower the coefficient of drag to .29 from .28. The leather and Alcantara interior has blue stitching and highlights. The Series.Blue also gets a red start button with "STI" printed on it. But not the 305 horsepower turbo engine from the WRX STI. It still makes do with 200 horsepower. A backup camera is now standard on all models, ahead of pending Federal regulations. The EyeSight package of safety systems is now available on all models except the base 2.5i. It includes Adaptive Cruise Control, Pre-Collision Braking and Lane Departure Warning. With this optional package, the Forester earns the IIHS Top Safety Pick Plus rating. The 2015 Impreza gets a refreshed design including new side mirrors, grille, headlights and front bumper. The cabins get more sound insulation and improved interior trim. A rear backup camera is now standard across the lineup, ahead of pending Federal rules. Cruise control, smartphone integration and a touch-screen radio are also standard. 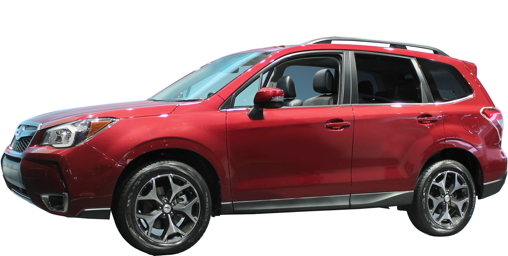 Impreza 2.0i Limited Sedan and 2.0i Sport Limited now offer optional Subaru EyeSight technology: Lane Departure Warning, Adaptive Cruise Control, Collision Warning and Pre-Collision Braking. Fog lights which illuminate corners are included in the package. Impreza Limited also now offers an optional Keyless Access system, to allow a driver to unlock the door and start the car without ever touching the keys in a pocket or purse. Fuel mileage is also improved. With the CVT automatic it is rated at 28 city and 37 highway. This model is significantly new for model year 2015. Although the engines are not changed, fuel mileage is significantly improved; also, the manual transmission is no longer offered. With 50 to 100 pounds more mass, acceleration is slightly slower. Much of the chassis is not significantly changes, though the rear brakes are a little larger. 17-inch wheels are now standard instead of 16. 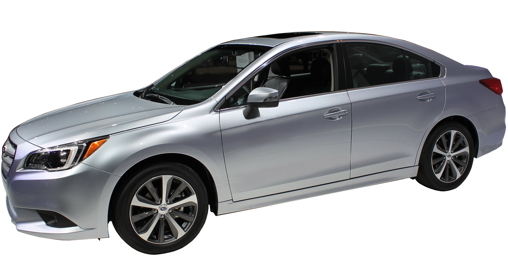 As is usual with new models, the Legacy grows in length, width, trunk volume and passenger volume. A Blind Spot Warning System and Cross Traffic Alert are now offered. A rearview camera is standard on all Legacy models, now. 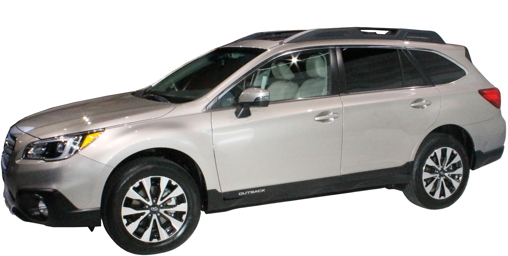 The new 2015 Outback gets all of the changes as the Legacy: better fuel mileage, no more manual transmission, bigger cargo capacity, larger passenger compartment, larger wheels and more safety features. The 2015 Subaru WRX is now offered only as a sedan. The fully redesigned WRX switches back to a 2.0 flat four-cylinder turbo engine after a number of years of a 2.5; however, horsepower is up by three (268) and torque jumps up by 14 lb.-ft. (258 lb.-ft.). The regular WRX model now comes with a six-speed manual, like its big brother. An automatic transmission is again available, but this time a Continuously Variable transmission instead of the four-speed that the 2002 WRX offered. Fuel mileage is improved: 21 city/28 hwy for the manual, 19 city/25 hwy for the CVT. 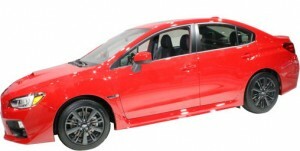 The WRX has a stiffer chassis, an inch longer wheelbase and larger brakes. The suspension is also significantly firmer and sportier. A new All-Wheel Drive system featuring Active Torque Vectoring directs power in a way that helps push the WRX out of corners. A rearview camera is now standard. 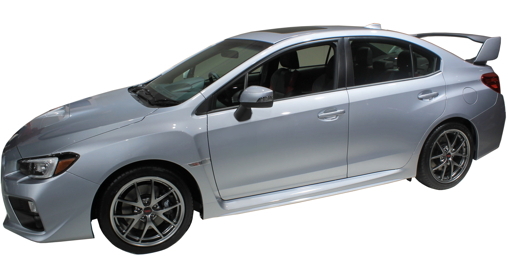 The WRX STI receives all of the improvements to frame and suspension as its little brother. 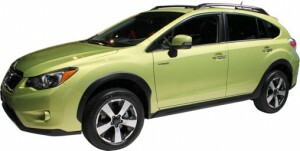 Most else, including engine, fuel mileage, transmission and brakes is unchanged. A new 2.0i model becomes the base model, kicking the 2.0i Premium up a notch. The 2.0i base model does not have heated seats, windshield washers or mirrors, all standard on other models. Ahead of federal rules pending, a rearview camera is now standard across the board, making good use of a new standard 6.2 inch infotainment screen. A 7-inch screen is available on Premium and standard on Limited, and includes the EyeSight features: Collision warning, pre-collision braking, adaptive cruise control and lane departure warning. The XV Crosstrek Hybrid will not offer the system at this time. The steering ratio is quicker for more nimble handling.